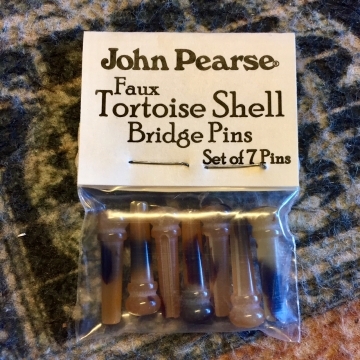 Packaged as a set of seven [for seven string guitars or six strings with a spare] these pins are absolutely the closest thing to the appearance of the REAL thing--the trade in which is now illegal, thank heaven! They are created from Casein, a phosphorprotein of MILK [!!] precipitated by heating it together with a mild acid to form this beautiful and extremely hard-wearing plastic!